By understanding the relationship between information and communication, we know that the information about an entity depends on that entity; see Principle of Communication exercise number 126 for more information. In this case, the information about an entity points to that entity, where the communication about an entity points to that entity as well. In terms of entities and information about entities, let’s consider webpages, websites, web browsers, computers and so forth. For instance, a webpage can be used to present information about an entity, where a web browser can be used to access that information. What is important here is that the information about an entity always depends on that entity and points to that entity, where that information is presented through a webpage or website and it is accessible through a browser. If a web browser enables us to access information through a website, there must be another tool that enables us to manage that information. This is where the Speak Logic Information Analysis comes from. The Speak Logic Information analysis enables us to manage information that is presented to us. For instance, the Speak Logic Information Analysis for Internet Explorer enables us to manage information that is presented to us through a website, while the Speak Logic Information Analysis Desktop enables us to manage information in our desktops. 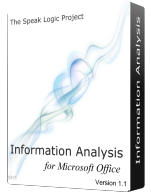 As well as, the Speak Logic Information Analysis for Microsoft Office enables us to manage information through Word, Outlook, and PowerPoint, while the Speak Logic Information Analysis for Visual Studio enables us to manage coding through Visual Studio; click here for more information and description about each software; click below to download specific software. For application modeling, a demo version can be download from SLPSoft website. There is a getting started user's guide which can be downloaded here. 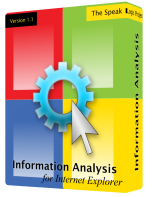 For Version 2012 of Speak Logic Information Analysis for Internet Explorer, Speak Logic Information Analysis for Microsoft, Speak Logic Information Analysis for Visual Studio and Speak Logic Information Analysis Desktop; additional features such as identify principle in selection, relate selection with principle, and interpret identified principle has been added. Only one version can exist at a time. In other words, you cannot install both Version 1.1 and Version 2012 of the same software. There is also a video section that provides a video tutorial for each software title. This is only for Version 2012; after installation if the application does not open, please download this file and unzip it in the installation directory. For Windows XP Download Now and for Windows Vista or 7 Download Now.